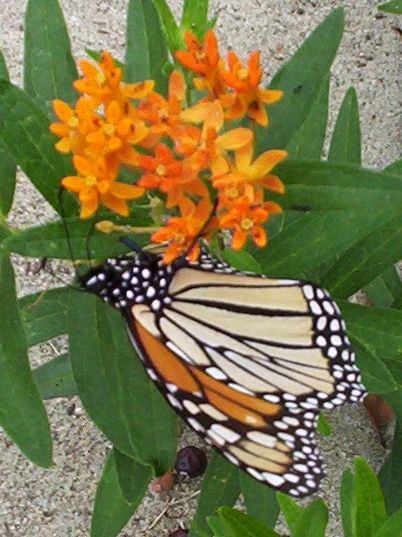 Starting in February, 2006, I maintained a serious garden journal online. Each day I photographed my perennial garden, recorded observations, and selected at least one representative photograph, sometimes more. 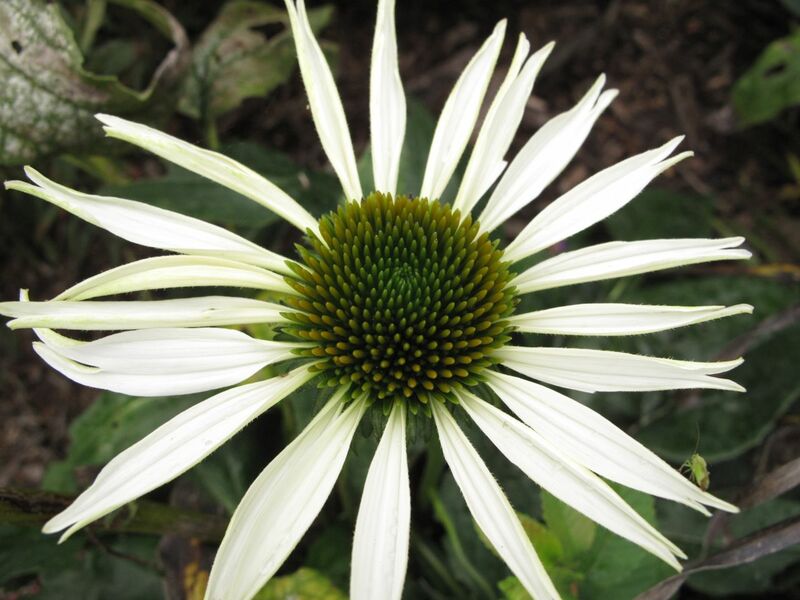 The discipline of documenting each day in the garden was a rejuvenating and healing act. The task of photographing the garden made me want the garden to look its best, so the garden was well tended that year. Being able to refer back to my garden journal and to be reminded how the garden appeared at certain points during the year; to see pictures of plants that were remarkable once, but that have not survived; to remember people who walked the paths once but who no longer live nearby; these things I value. At the time the best reward of that forced interaction with my garden came in the experience one has from tending anything that then responds back, gently and surely, stronger the relationship each day. Without the compulsion to get the daily photograph what delights I would have missed. 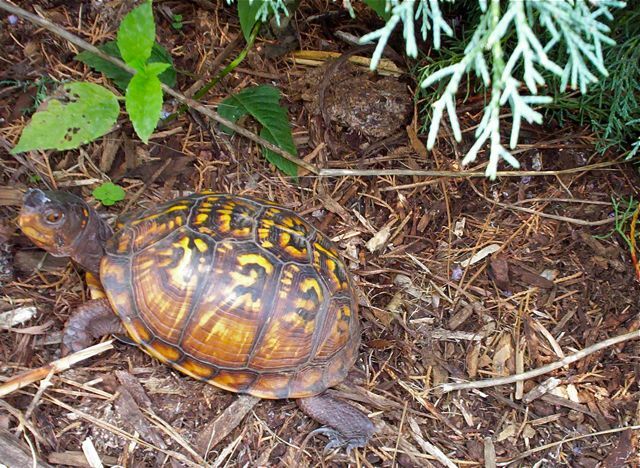 I would not have known of the Eastern Box Turtle, that interesting visitor who journeyed into to my garden one day. Many blossoms might have peaked, then withered without my seeing. The surprises were many. Many days I wondered where could this plant have been yesterday, how could I have walked the same path without being awestruck. My connection to the garden was intimate; the place itself was safe. There was a knowing and a healing that occurred there; the simplest or the most complex of tasks became a meditation. Inattention during the intervening years has dissipated my satisfaction with the garden, but a main goal of redesigning and renovating the garden is to recover and rediscover that sense of place. 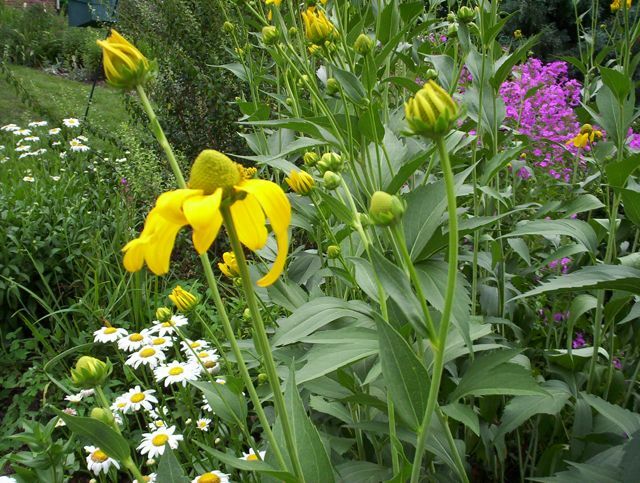 This entry was posted in garden, pbmgarden renovation and tagged garden journal, garden renovation, gardening, meditation garden on February 5, 2011 by pbmgarden. One desirable feature for the garden’s new design is a meditation path. Since there is no space or budget for a full Chartres 11-circuit labyrinth, the layout will be unbound by traditional arrangement or spiritual principles. 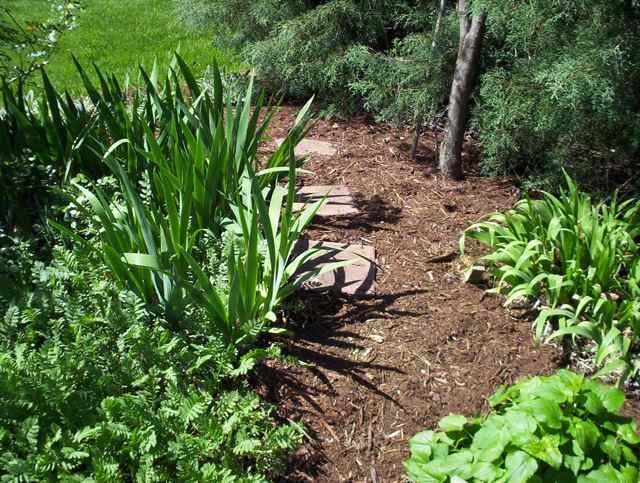 Yet a simple stone path meandering gently among the garden plantings will help establish the garden as a setting with purpose. A place to be, not just to view. A destination for a peaceful walk, an invitation to explore. Currently the garden has several little paths. Seen below in April, 2006, the is the back left corner of the garden where irises are guarding the little path. The irises on the right are Janpanese Iris from Kathleen’s yard in Idaho. Those on the left are from Henrietta’s Wave Road beds. Tansy in the left foreground from Phyllis T., provides a pretty texture. 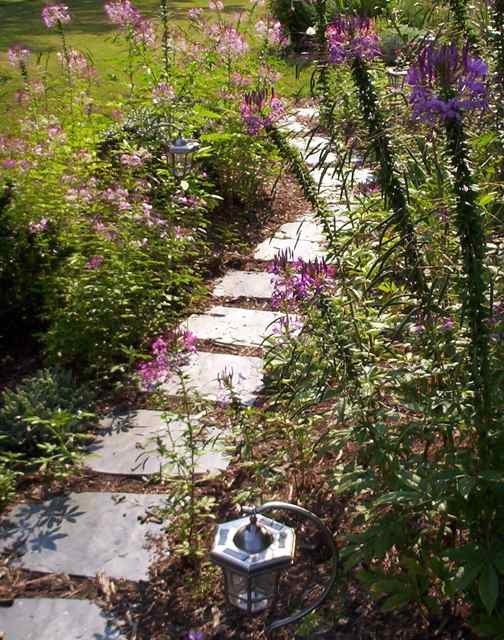 Below is a blue slate path that runs along the southern side of the house, viewed here in June, 2006, with majestic cleome. This entry was posted in garden, pbmgarden renovation and tagged gardening, meditation garden, meditation path on January 12, 2011 by pbmgarden.